The 2004 Mach 1 standard features included: an exclusive 305 horsepower DOHC 4.6L V8 engine, dual exhaust, special suspension tuning and lower ride height, 17-inch aluminum wheels, a shaker hood scoop, and black over the top stripes and rocker stripes. The Mach-1 could be ordered in Azure Blue, a Mach-1 only paint color; or Competition Orange, Oxford White, Screaming Yellow, Dark Shadow Gray, Black, and Torch Red. Competition Orange 2004 Mustang Mach 1 Coupe with Mach 1 black side stripe, Mach 1 black wheels, blacked out rear spoiler/wing, and black hood scoop. This Dark Shadow Gray Mustang Mach 1 coupe was at the 2010 Mustang Club of America Grand Nationals held in Bellevue, Washington. 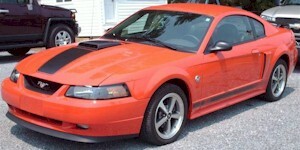 It has the Mach 1 5 spoke wheels, hood scoop, side scoops, rear spoiler, and black side and hood Mach 1 stripes.